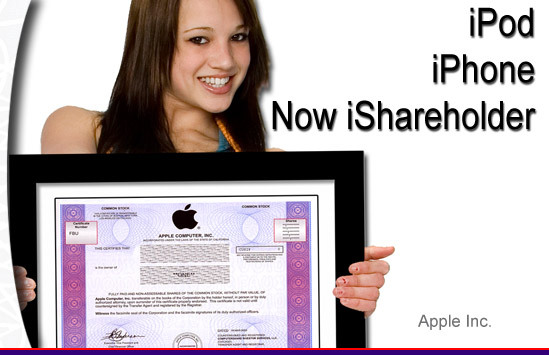 True stock ownership and a framed stock certificate. The shareholder is entitled to annual reports, declared dividends, & any shareholder perks making a gift that is fun, educational, & who knows, maybe profitable too! It's Easy! Buy stock in two minutes with a credit card. The qualities below show why framed stock is such a unique gift! The recipient's name appears on the front of the certificate and the engraved plaque allows you to truly personalize this gift with words that give it lasting meaning. This gift lives beyond the initial event because the recipient participates as a shareholder by receiving annual reports, declared dividends, voting, and who knows, maybe even profits. The perfect gift to teach kids (even grown-ups) about investing and the stock market. Add our I'm A Shareholder book and you have the perfect formula for teaching kids about the stock market. Stock certificates are ornate works of art. Most have intricate raised printed images that come to life as symbols of American business. There is a story behind every stock certificate. Events and personalities can change overnight to contribute to the collectible value of a stock certificate. 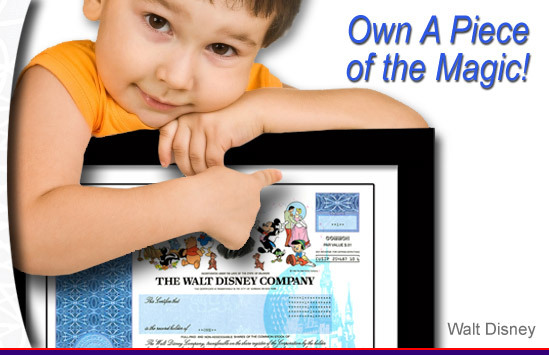 Example: just before Pixar merged into Disney, there was huge demand for its stock certificate that had movie characters and Steve Job's printed signature on it. Now certificates sell for over $500 on scripophily.com.